Madura(sweet) seva is a sweet fried snack from Kerala which tastes delicious with a cup of tea.As a child,I had lots of homemade kerala snacks that mom made.This is another nostalgic post which reminds me of the good old childhood days.This is my mom's recipe that I grew up munching and is a fool proof one.My kids love all these kerala snacks and so make something or the other for their snack time.These sevs are coated with sugar and are crunchy to munch.I must also say that these are addictive too.I had posted a north Indian style hot and spicy sev sometime back which is tasty in its own way.Try making these at home if you love this snack and enjoy with a cup of tea !! 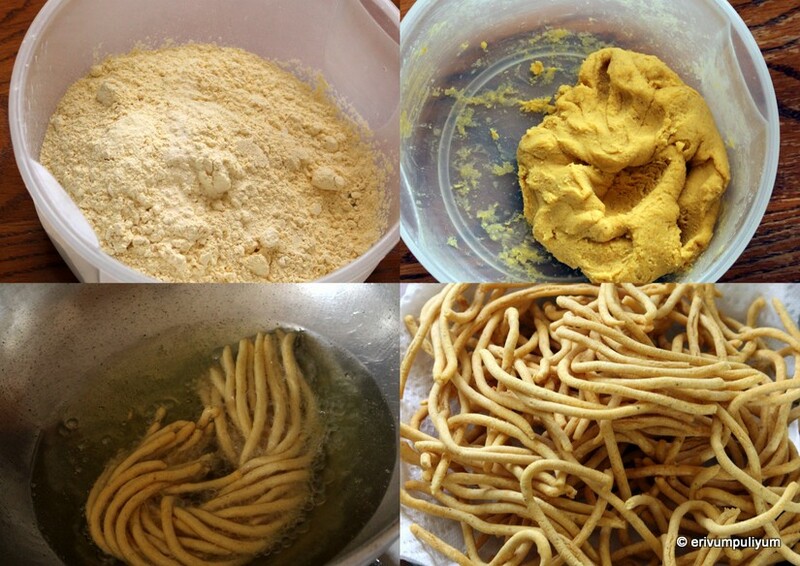 In a bowl,combine the chick pea flour,cumin seeds,turmeric powder and salt.Add water little by little and knead the dough in a smooth dough like for chapathis(I used 1/2 cup+ 2tbsp water to knead the dough but you may require slightly less or more,so add little by little).Keep the dough covered. If you have powdered sugar,omit this step.Else powder 2tbsp of granulated sugar in a blender to get powdered sugar(don't use confectioners sugar or icing sugar as it has corn starch in it). Heat oil in a wok/kadai upto 2" deep and wait till oil is hot on medium flame.In the mean time,keep ready the idiyappam mold with the big hole attachment.scoop out spoonful of dough in the mold and close the lid. When oil is hot,press the mold holding over the oil and form concentric circles till the surface is covered(don't over crowd the wok). Flip and turn both sides using a slotted spoon(takes lesser time to cook and gets done faster). Drain on paper towel and repeat the same step till you finish with all the dough,fry them all.Switch off flame and then break/gently crush the circles in 1"-2" pieces and keep aside. Heat another pan to make sugar syrup.Add the sugar and water mentioned in the pan and wait till it starts to boil.When the sugar syrup reaches one string consistency,add the cardamom powder.Also,immediately lower the heat,slide in the broken sev pieces in syrup and toss well.Switch off flame and moving away from residual heat,keep mixing until it starts to get coated to the sev. Finally,add the powdered sugar when slightly cooled (which gives a nice classic look like store brought ones and also helps to dry out the syrup faster) and toss well. Cool completely before storing in air tight containers(stays good for a month). * You can omit the cumin seeds but it definitely adds flavor. 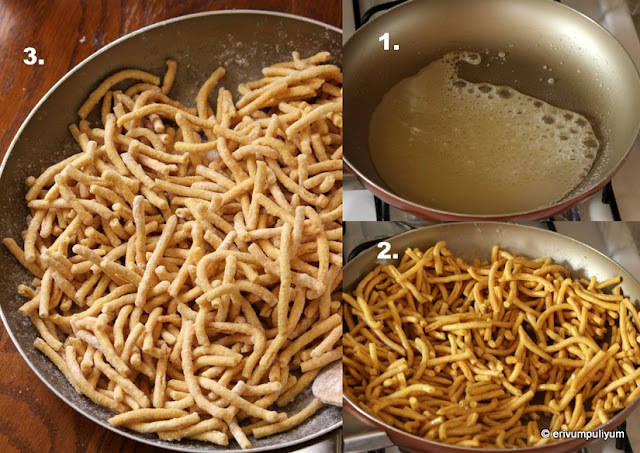 * Always fry the sev in medium heat else the inside may not cook well if fried on high heat and turn soggy once added to sugar syrup. *Adding powdered sugar at the end is optional but it gives a neat finish. I remember eating this snack when I was a kid. My Mom used to make this. I have to try this out for sure. I love this for my tea time snack ....happy weekend to u too Julie..
Looks really very tempting dear.. The clicks are just inviting dear..
Julie the pics are uh-mazing! OMG this has been abosulte childhood favourite..U took me back to those good old times. I didnt have a clue this can be made easily at home. Whether or not I will make it is a differnt question but always good to a have a recipe hany..thanks for sharing. Perfect snacks for tea time! This is one of my favorite snack.. Brought back so many memories... Looks very delicious.. i am surely going to try this.. I love sweet sevai, in fact one of my all time favourites....we too make it but with jaggery:)...Lovely clicks and so tempting! !